Modular ticket vending machine (TVM-m) allows public transport passengers including metro, railway and ground transport to purchase fare media and/or reload or renew an existing one. TVM-m works with nearly all standard types of fare media as well as smart tokens. It can be easily integrated into existing ticketing and payment systems. TVM-m can be located in closed or open stations, outdoor, indoor, at strategic points of passage. Single journey ticket vending machine (TVM-s) allows public transport passengers to buy single ride tickets right on board without driver involvement. TVM-s accepts payments made by banknotes, coins and bank cards with PayPass / Paywave support and provides change. It has compact size, designed with passenger safety in mind and can be easily integrated within existing ticketing system. Token vending machine offers public transport passengers a quick and easy option to skip the queue and purchase tokens or smart tokens. TVM-t accepts cash only in a form of banknotes and coins and gives back change. It can operate autonomously or as a part of automatic fare collection system, and is well protected against vandalism. 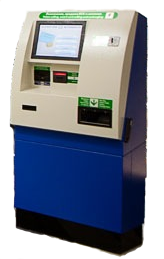 Ticket reloading machine (TRM) offers public transport passengers a quick and convenient option to check remaining value on existing fare media as well as add extra funds with contactless PayWave / PayPass bank cards. TRM also supports smartphones with NFC module.